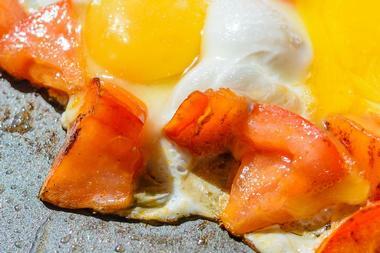 San Francisco is all about lifestyle, and good food is an essential part of the daily routine. 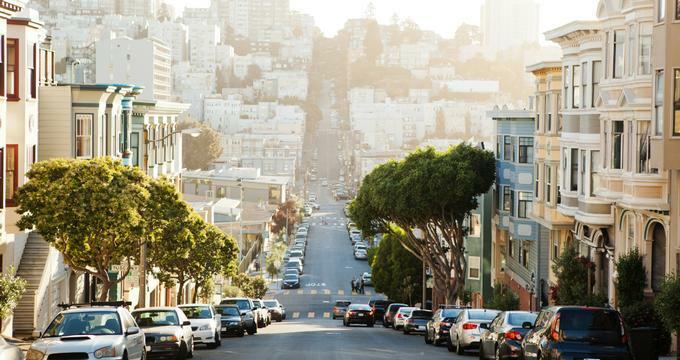 More of a morning city than a night one, San Francisco takes breakfast seriously and has a fantastic choice of breakfast and brunch spots from casual cafés to fine dining establishments. Weekday mornings draw a working crowd on the way to the office, while weekends see languid brunchers taking their time over eggs benedict and mimosas while soaking up the sun. Whether it’s a mouthwateringly flaky pastry still warm from the oven or stacks of pancakes dripping in maple syrup and topped with blueberries, San Francisco has a table with your name on it. Located in the heart of Fisherman’s Wharf, Surisan is contemporary and welcoming space named after a mountain in Korea that serves American Thai Fusion, Korean and Asian-inspired cuisine for breakfast, brunch, and dinner. Boasting outdoor and indoor seating and lovely views, Surisan has fast-become one of the go-to spots for brunch with a menu of modern Asian-fusion cuisine created by Nick Soon, a five-star chef from one of Korea’s top hotels. Highlights from the breakfast menu include blueberry stuffed crunch French toast, specialty benedicts with a variety of toppings including smoked salmon, Dungeness crab, or KFC (Korean fried chicken), and the signature Millionaire’s Bacon, which is thick cut free-range bacon baked with brown sugar, cayenne, red and black pepper. Appropriately named for its fantastic location in one of San Francisco's trendiest hot-spots, the Beach Street Grill Organic Restaurant is an organic restaurant that serves up organic, gluten-free, and vegetarian comfort food in a casual and relaxed setting. 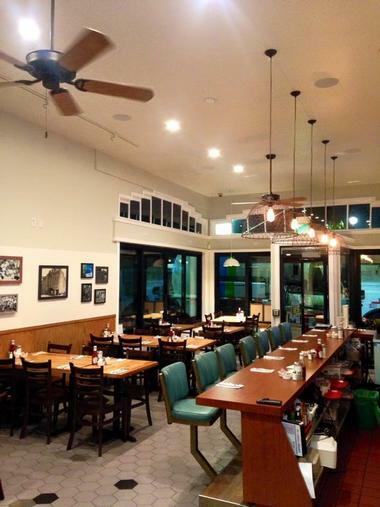 Open breakfast, lunch, and dinner, which can be enjoyed indoors, on the patio outdoors, or in the comfort of your hotel room with their delivery service, the friendly eatery draws a regular crowd. Breakfast menus feature favorites such as omelets made with organic eggs and a variety of fillings such as Dungeness crab when it is in season. Other mouthwatering breakfast plates include eggs benedict with spinach, bacon, ham, wild salmon or fresh crab, freshly baked pastries and croissants, and organic breakfast sandwiches and wraps. Located in the famous Ferry Building Marketplace, Boulette’s Larder is a distinctive chef-driven and refreshingly refined eatery that serves a seasonal menu of globally-inspired cuisine. Tucked away in a quiet spot away from the tourist throngs of the Ferry Building, the acclaimed restaurant is a great spot for breakfast with modern takes on traditional favorites such as a yogurt bowl with cow, sheep, or goat milk yogurt topped with basil seeds, berries, and rose petal jam. Other delights on the breakfast menu include poached eggs served atop black cocoa beans and braised chard, and smoked wild king salmon served on Meyer lemon toast with a dollop of crème Fraiche. 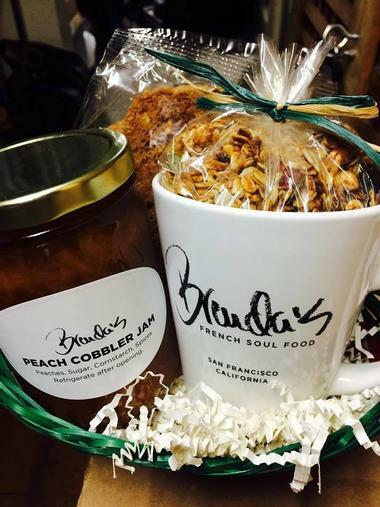 Brenda's French Soul Food is a French-inspired café that serves an array of southern-style cuisine in a small and cozy spot. Borne from a desire to share soul-stirringly good food with the community, Brenda's French Soul Food does just that with a menu of mouthwatering breakfast, lunch, and dinner plates and special dishes such as beignets, po' boys other Big Easy bites. 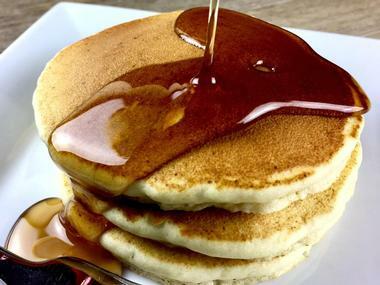 The breakfast menu features Southern classics such as shrimp and grits, biscuits and gravy, crispy pork belly and beignets, as well as regulars like omelets, pancakes, French toast, homemade granola and yogurt and fresh fruit bowls. 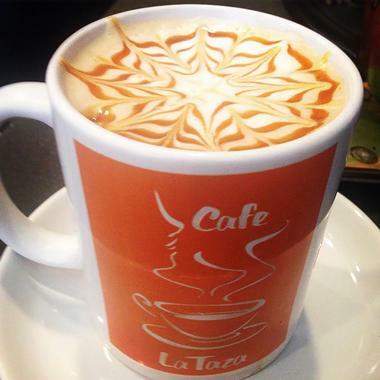 Boasting two locations in the city on Mission and Post Streets, Café La Taza is a favorite spot for breakfast and lunch with locals and visitors alike. The friendly, relaxed cafés both serve a variety of classic plates such as multi-egg omelets with a variety of fillings, corned beef hash, French toast, and pancakes, as well as unique dishes such as the El Campesino with two fried eggs and garlic rice topped with bacon jam and served with house-roasted bacon and avocado. Other favorite breakfast bites include huevos rancheros, chilaquiles, chili con carne breakfast, crab cakes and eggs Florentine, along with freshly brewed coffee and tea. Small and cozy, Darren’s Café is a bright and vibrant café on Taylor Street that serves a menu of traditional American favorites with an Asian twist for breakfast and lunch. 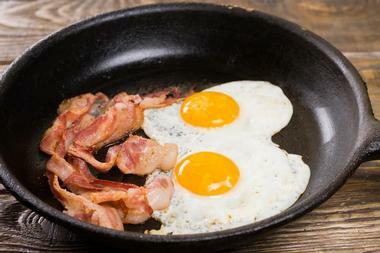 The breakfast menu boasts classic dishes such as eggs done in several ways, multi-egg omelets with different fillings, pancakes with sweet or savory toppings, French toast with bacon and syrup, and breakfast plates of eggs, bacon, hash browns, grits, and sausage. Other favorites on the menu include chicken and waffles, corned beef and hash, three cheese omelets and a variety of benedicts, as well as a wide range of Asian-inspired fare such as chow mein, fried rice, po’s, shrimp dishes and soups. Dottie's True Blue Café is a quintessential American-style café with tables covered with old movie-star photos and warm and friendly service. 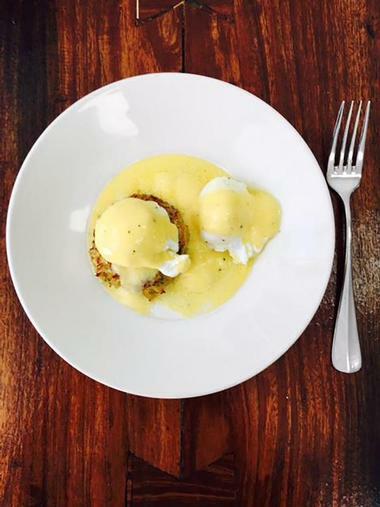 The charming eatery serves breakfast and lunch in a casual and relaxed atmosphere with menus of hearty helpings of homemade fare and fresh coffee. 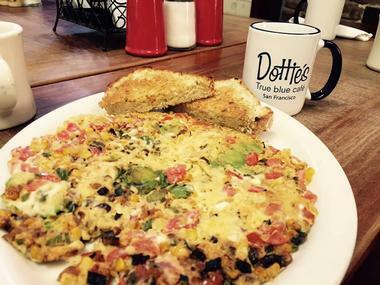 Breakfast specialties include The Southwestern omelet with andouille sausage, jack cheese, peppers, and onions served with home fries and salsa; Dottie’s famous buttermilk pancakes spiced with ginger and cinnamon and served with pure maple syrup; and Black Bean Cakes and Eggs done in any style and served with chili-cheddar corn bread and golden fries. Farm: Table is a charming micro-café that specializes in organic and sustainable fare prepared from fresh, locally sourced ingredients and served in creative and unique ways. The pet-friendly café serves a variety of locally roasted single origin coffee and tea, and delicious breakfast and lunch menus, which draw health and environmentally-conscience diners. Menu favorites include house-made granola with nuts and seeds, daily homemade toast and tarts, steel cut oats, and eggs on croissants, freshly baked local pastries, and a range of specialty coffee beverages. Located in the heart of San Francisco’s tourist-filled Fisherman's Wharf, the Hollywood Café is a casual spot with walls adorned in photographs of Hollywood stars and comfortable seating. The café is a popular spot with locals and visitors alike with menus featuring dishes named after stars from Hollywood's Golden Age. Breakfast offerings include the Audrey Hepburn (two pancakes and a fresh fruit bowl), the Marilyn Monroe (French toast and a fresh fruit bowl), the Vivian Leigh (scrambled eggs topped with bacon and cheddar cheese on a toasted croissant and a fruit bowl), and the Gregory Peck (sunny-side-up eggs, sirloin steak, hash browns, and toast). Honey Honey Café & Crepery is the spot to head to for mouthwatering crepes with a variety of special crepes and delicious fillings to choose from. 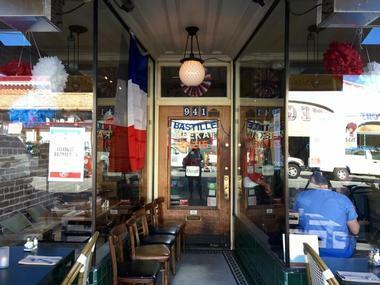 The charming café on Post Street specializes in the French treat and can be enjoyed with a range of fillings from savory breakfast crepes filled with Cheddar cheese, ham, onion, egg, and bell pepper to sweet dessert crepes filled with strawberries, Nutella, and honey. The casual, counter-serve café also offers a selection of other breakfast fare such as pancakes, waffles, breakfast sandwiches, egg scrambles, and bowls of oatmeal, granola, and yogurt. 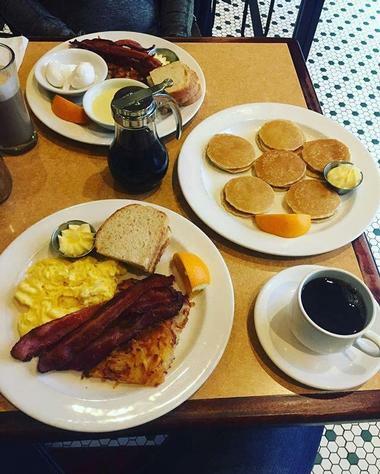 Joanie's Happy Days Diner is an old-fashioned diner with cheerful servers pouring endless cups of coffee and mouthwatering aromas of sizzling bacon and eggs. 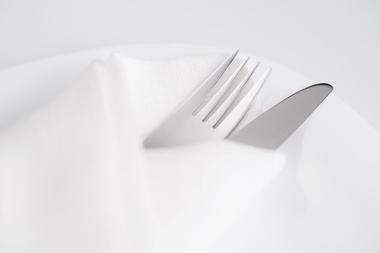 Located on Columbus Avenue in North Beach, the charming diner serves good-tasting breakfast and lunch fare with an old-fashioned feel that takes customers back to a bygone era. An excellent spot for breakfast with lovely views from the sidewalk of Joseph Conrad Square, the menu features favorites such as fluffy and light buttermilk pancakes with bacon, sausages and eggs, breakfast burritos filled with eggs, cheese, chorizo, and hash browns, and ham and cheese omelets. 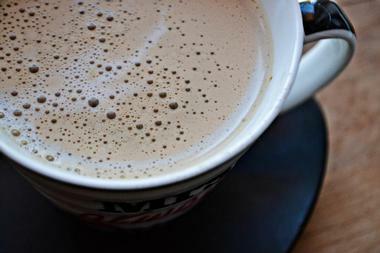 The fare is served with an assortment of coffees, from espresso to latte, hot chocolate, various soft drinks, juices and bottled beer, and commendably thick milkshakes. La Marsa Restaurant & Wine Bar is a Mediterranean-inspired restaurant and bar that serves impressive Tunisian cuisine in the heart of the art district. Surrounded by theaters, galleries, luxury hotels and boutique stores, the elegant restaurant serves breakfast, lunch, and dinner in a cozy and warm setting. 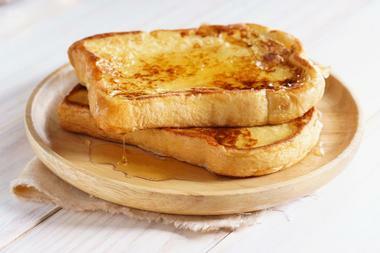 Breakfast offerings include traditional French crepes with cinnamon and sugar, eggs Benedict with creamy hollandaise, three-egg omelets with a variety of fillings, breakfast sandwiches and wraps, and griddle favorites like pancakes, Belgian waffles, and French toast. 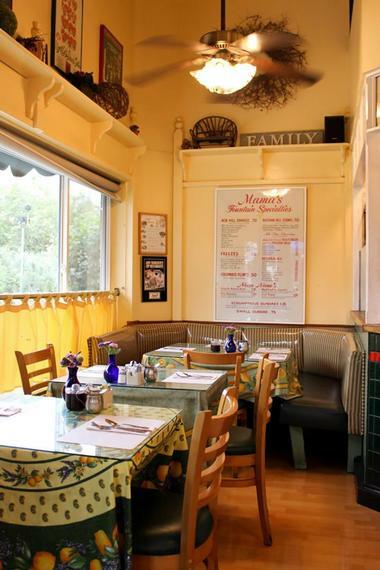 One of the city’s dining institution, Mama’s is a cozy, family-owned veteran restaurant that draws crowds who come to enjoy the delicious fare and warm ambiance. Located on the corner of Filbert and Stockton Streets in Washington Square in the Italian District of North Beach, the charming restaurant was founded in 1964 and has been serving hearty home cooked fare for breakfast, brunch, and lunch, along with freshly baked goodies and gift baskets for the past 45 years. 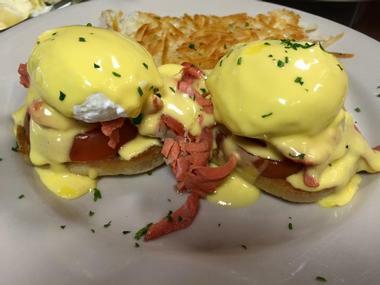 Breakfast favorites include M'Omelette's, served with Mama's grilled potatoes and toast of choice; and Mama's Benedicts with two poached eggs served on toasted English muffin, topped in hollandaise sauce and a side of Mama's grilled potatoes. 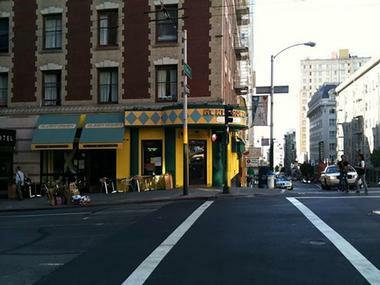 Mo’s Grill is a low-key and relaxed American grill and San Francisco institution that serves breakfast and lunch in a casual, laid-back setting. Located on Grant Avenue, the charming eatery draws breakfast goers who tuck into traditional favorites like scrambled eggs with scallions and cream cheese, old-fashioned pancakes with banana, organic blueberry or chocolate chip toppings, and breakfast burritos filled with scrambled eggs, spicy sausage, BBQ roast pork, ham, scallions, tomato, and jalepeños, and served with home fried potatoes. 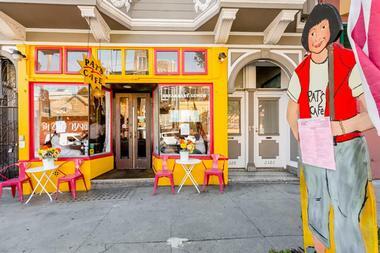 Located in Nob Hill along the trolley line, Mymy is bright diner-like café and fantastic breakfast, brunch, and lunch spot. The charming eatery draws a large weekend crowd with a wait for a table in the mini space, but the brunch menu is worth the wait with dishes such as golden-brown stacks of powdered sugar-topped pancakes, six varieties of eggs Benedict and fluffy French toast topped with extra-crispy bacon and maple syrup. 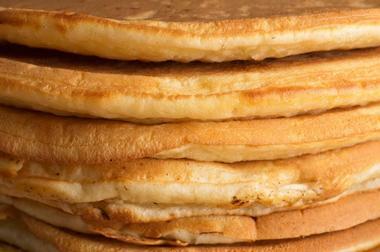 The delicious fare is accompanied by a variety of specialty coffees, fresh and cold-pressed fruit juices, and mimosas. Pat's Cafe is a charming little North Beach restaurant in the heart of San Francisco that serves healthy, hearty, home-style food for breakfast, lunch, and dinner. The famous grill, which was mentioned in Tom Clancy's book, ‘Dead or Alive,’ offers breakfast favorites such as a large variety of fluffy omelets and egg dishes, scrambles and benedicts, stacks of syrupy pancakes, Belgian waffles, and French toast, and world famous specials like the Cold Wild Smoked Salmon Benedict, the Crab or Shrimp Crepes, and the Eggs Florentine. 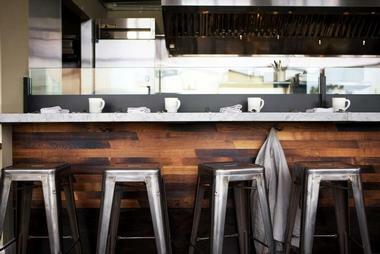 Set in what was once an old architect's studio in a quiet patch of San Francisco's Potrero Hill, Plow is one of San Francisco's best brunch spots. The casual, farm-to-table eatery features a lively, rustic dining room with oak-barrel tables and serves a menu of mouthwatering cuisine, which has diners waiting for up to two hours for a table. Plow's brunch offerings include Huevos rancheros, ricotta pancakes, breakfast sandwiches packed with cheddar and aioli, two eggs an a choice of sausage, silver-dollar-sized almond pancakes, and the chefs' signature crispy potatoes, which come fresh from the fryer, deep golden and seasoned with woodsy herbs. Don’t miss the signature sweet potato, red pepper and duck hash served with two eggs. 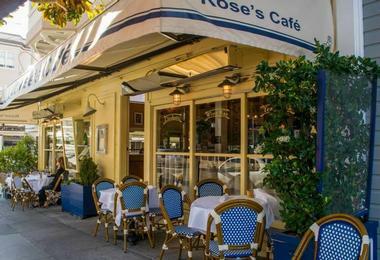 Rose’s Café is a quaint little Italian spot with ample outdoor seating, spectacular wild floral arrangements, and a wood-fired pizza oven that produces mouthwateringly good hand-tossed pizzas. The charming eatery brings a slice of European style to the Marina with freshly baked bread and pastries on offer every morning, along with a morning menu of breakfast pizzas laden with smoked ham, fontina, and eggs or smoked salmon and creme fraiche, still-warm ham and cheese croissants, and fruit focaccia and sour cream coffee cake. Located in the Lower Pacific Heights neighborhood of San Francisco, Sweet Maple is a relaxed and casual neighborhood restaurant, coffeehouse and gathering place for the local community and visitors alike. 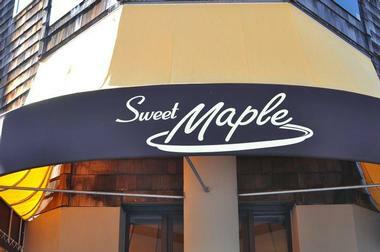 Hailed as being one of the best brunch spots in the city, Sweet Maple serves a classic American breakfast and brunch menus prepared with locally sourced ingredients and touches of Asian accents and flavors. Brunch delights include their world-famous Millionaire’s Bacon - extra-thick, sweet and spicy bacon that is slow-cooked for hours with brown sugar and seasoned pepper; and deep-fried French Toast, along with bottomless mimosas and bloody Marys. The Taylor Street Coffee Shop is a bustling, cozy neighborhood spot serving traditional American breakfast and lunch fare in relaxed, laid-back setting. A long-standing favorite of city-goers who love a good breakfast, the Taylor Street Coffee Shop serves a healthy breakfast menu with plenty of items for all tastes from eggs and scrambles to breakfast sandwiches and burritos, fresh fruit bowls, golden hash browns, bacon, sausage and grits, and a mouthwatering breakfast pizza. Boasting a casual, laid-back atmosphere in which to enjoy an early or late breakfast, the Taylor Street Coffee Shop promises hole-in-the-wall good food. Opened in 1916 in what was once a boarding house, the Buena Vista Café is a long-standing San Francisco institution that is famous for its signature Irish coffee and an acclaimed menu of American staples. The historic landmark is renowned for introducing Irish coffee, which, after a few attempts was a success and is served in many of the city’s restaurants, bars, and cafes. Today, the café serves all-day breakfast, and a selection of lunch and dinner favorites, including world-famous Dungeness crab omelets, eggs Blackstone, and 100% Angus Beef burgers and steaks. The Grove is a friendly, neighborhood café that offers a vibrant spot for the community to gather, enjoy good food and beverages and socialize in style. 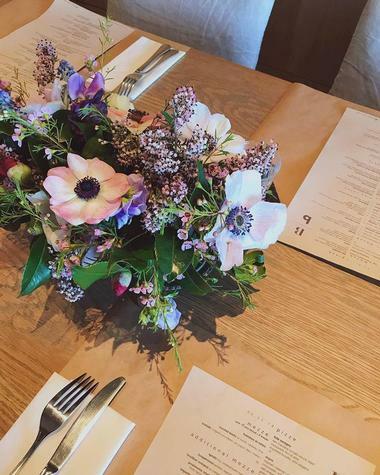 Owned by husband and wife team, the Grove serves a menu of Northern Californian cuisine made with fresh, locally sourced ingredients that are more often than not handpicked by the team. 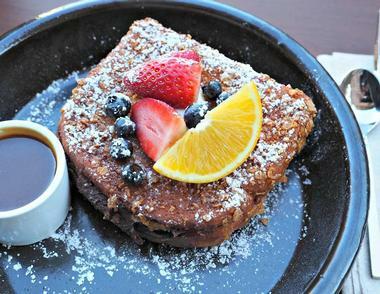 Boasting several locations around town, the Grove is a fantastic spot for breakfast and brunch, with favorites such as eggy French Toast, breakfast burritos filled with soft scrambled eggs, crispy golden rosemary hash browns, smoky black beans, and mashed avocado, steel-cut Irish oatmeal, house-made granola, and fresh fruit platters. Also on offer are warm cinnamon roll bread pudding, eggs benedict with Cambridge House Royal Smoked Salmon, and breakfast tacos. 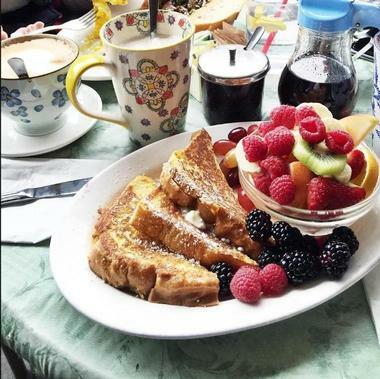 Zazie is a charming, petite French bistro that boasts lovely outdoor patio style seating and draws a regular crowd for breakfast and brunch. The breakfast menu features starters of seasonal coffee cake, steel-cut oats with raisins, walnuts, and brown sugar, organic granola with fruit and yogurt and toasted bagels or baguettes with a variety of toppings. 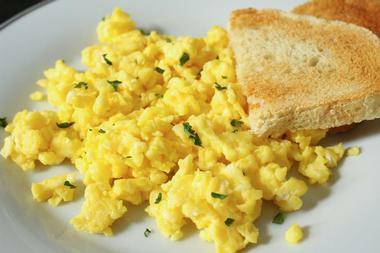 Also on the menu are a range of eggs done in any style, scrambles, benedicts and omelets, and griddle specials like pancakes, waffles, and French toast. House-roasted and freshly brewed coffee is always on the go, as well as fresh fruit juices, teas, and other beverages.